Welcome to Scotland in the magnificent landscapes of the Highlands where the moors of heather are adorned with supernatural colors. Surrounded by beautiful mountains and silver hills, the Caledonian Canal stretches from the Highlands capital, Inverness, to Fort William to the south. Get ready for a magical boat cruise to the vast Loch Ness, home to the world's most famous monsters, Nessie, Loch Oich islands and Loch Lochy, dominated by Ben Nevis, the highest peak in Scotland. Water sports are available throughout the hotel, where guests can enjoy canoeing, windsurfing and water skiing. salmon fishing, dolphin watching and ... Nessy! 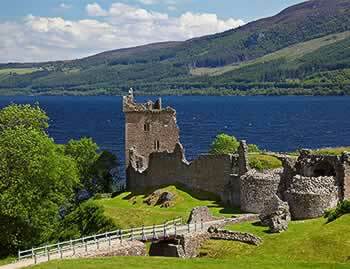 From Laggan, only round trip cruises are possible.Meet Loch Ness. From Laggan, only round trip cruises are possible.